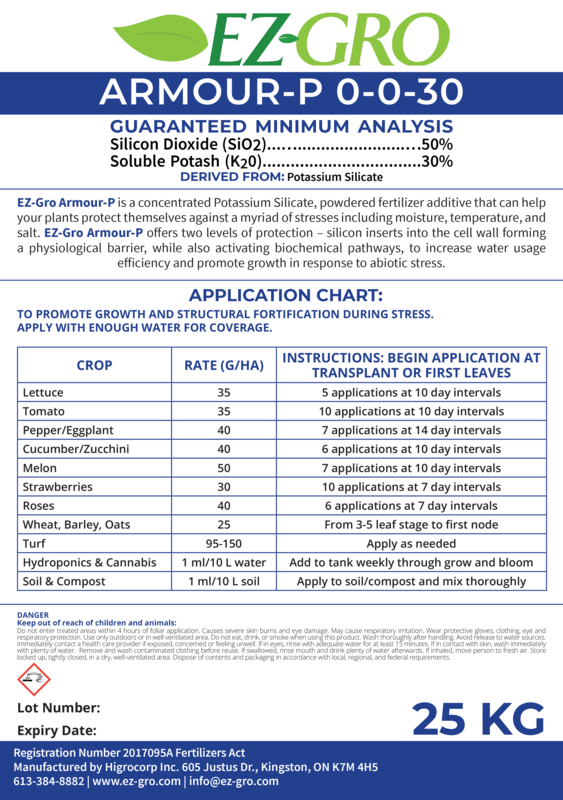 EZ-Gro Armour-P is a concentrated Potassium Silicate powdered fertilizer additive that can help your plants protect themselves against a myriad of stresses including moisture, temperature, salt, and heavy metals. EZ-Gro-Armour-P offers two levels of protection – silicon inserts into the cell wall forming a physiological barrier, while also activating biochemical pathways, to increase water usage efficiency and promote growth in response to abiotic stress. Apply during times of stress to help your crops defend themselves and survive detrimental conditions. • Potassium Silicate is abundant in soil and readily taken up by plants to offer structural fortification and regulation of water use. • Silicon Dioxide, found in Potassium Silicate, plays an important role in abiotic stress resistance during drought or saline stress, strengthens cell walls and prevents lodging.